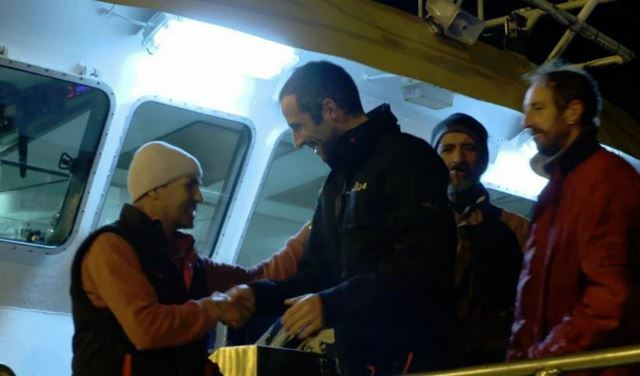 Rescued by the Portuguese crew of the "Sonho de Infancia" Tuesday night, Armel joined this morning the port of Vigo in Spain where expected members of his team. He gives us his first words before joining his relatives in Brittany. After Ouessant we find ourselves in a somewhat complicated wind zone. There was a transition, we decided to go for a little more wind in the west. Indeed we find ourselves again to catch up with our little comrades who had escaped a little, there are four boats in front of me and very quickly we recover some places, due in particular to the damages of two direct competitors Gitana and Sodebo, and then I found in second place on Monday night in the Bay of Biscay where we went to look for this second that we had already well monitored for several days in Saint-Malo on the ground with my team, so we finally continued our strategy as originally planned. We really had limits in force of wind and sea state, to be able to preserve the boat. Above all, the goal with the team was to arrive in Guadeloupe. We knew we had the potential to make a beautiful place, but first of all the main thing was to arrive. For that we had put limits to the weather conditions. Despite our departure delay, we have not changed this course of action with Marcel my with my team ashore, so we continued this strategy, so we had a small counter-board to make in the west to get a wind rotation, in wind conditions and sea a little stronger but not at all dantesque. We went up to 5 meters deep, there were gusts at 35, 40 knots maximum, but it was not going to last very long. Tuesday morning, I am close to the east of the Azores and we continue our road map with our weather team ashore. The conditions were a little degraded as expected, we have 35 knots of wind, the sea was formed a little, I am at that time with the minimum sail on board of Banque Populaire, 3 reefs in the , the so-called J3 the , the smallest sail up close, and the boat advance normally. I really reduced the speed so as not to hurt the boat because we know it's a little bit complicated to pass that behind the conditions in the evening will improve significantly, and that eventually it will be really the descent, the slide to the West Indies. All goes well, I managed to sleep a few hours the previous night to just pass these conditions a little difficult, and then the boat is moving normally. I am at this moment in standby at the level of the piano to be able to be able to the plays because there were from time to time small windings . All of a sudden, the boat to the side, in a few seconds, I do not really realize what's going on, the boat is completely gitted, I realize that we are capsizing. I see the in the wind that is detached from the boat, so I tell myself that there must have been something that has failed, I do not know what, in any case, I am rather in the urgency of managing the crisis, especially for me to try to find a solution to be safe and find myself if possible inside the boat in the central hull when the boat has finished turning around. I do not know what happened, it was very fast, the , or something that broke loose. There for once, it was so brutal and so fast that I was surprised, I did not expect that of course. Already I had to get into the boat, it was not easy. I managed somehow to reach the central hull and to return by the porthole which is planned for that, in the back, and thus to find myself inside the boat, in safety, to be able to trigger the relief and especially distress . I operated it quickly enough, then I was able to open the survival bag that is on board to be able to immediately have the first tools to be able to put me in safety and finally contact the ground. I called my team to tell them that I was on board and that it was okay even if I had sore ribs, I was a little stunned but I was in the boat safe and sound and I now waiting for help to pick me up. It took a little while. 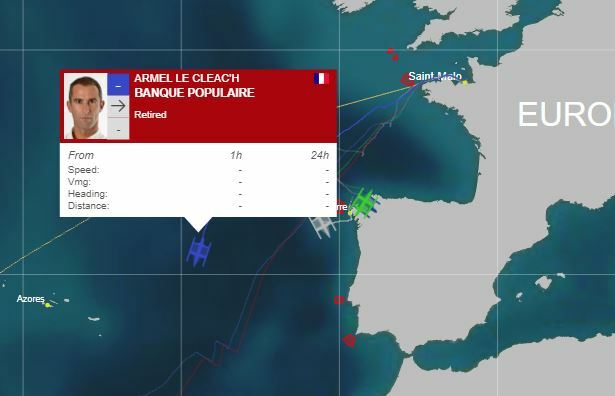 After the organization of the rescue was set up with the various security agencies, the French Navy, the Portuguese Navy, the Race Direction and the Team Banque Populaire. Things were done gradually, I was in contact with the earth regularly, they gave me news. Already, they had the position of the boat, which was pretty good. Then it was necessary to divert one or more boats. I knew later that there was a cargo ship and a fishing boat that would join the area I was on and that a French plane would take off to fly over my position and that a second Portuguese plane was also going to come on area. It took 6-7 hours before the arrival of the first French plane, with which I made contact by to clarify my position, to say that all was well on board, and at that moment they informed me that a Portuguese fishing boat had been baffled and that it was going to arrive on zone at the beginning of the night around 8 pm 21h (French time), to be able to help me. First I was picked up by the fishing boat, it was still a pretty hot time, because the conditions of sea and wind had not really calmed down. On the zone, it was always well shaken, it stirred a lot in the boat. The fishing boat arrived around 20h. We had set up an organization for my rescue: I had exchanged with the two planes to tell them how I could get out of the trimaran and join the fishing boat. I had planned to put my liferaft into the sea, get in it, and if possible join the fishing boat at that time to get on board. This is what I managed to do around 21h. It was a little complicated because the sea was difficult, it was dark but fortunately, the fishing boat and especially the Captain was very well maneuvered, the crew was great, they really helped me in this maneuver . Very quickly I managed to board this Portuguese fishing boat where I was very quickly welcomed, they offered to take a shower to give me clothes because I only had my survival suit , and worried about whether I was fine. Really very nice crew. 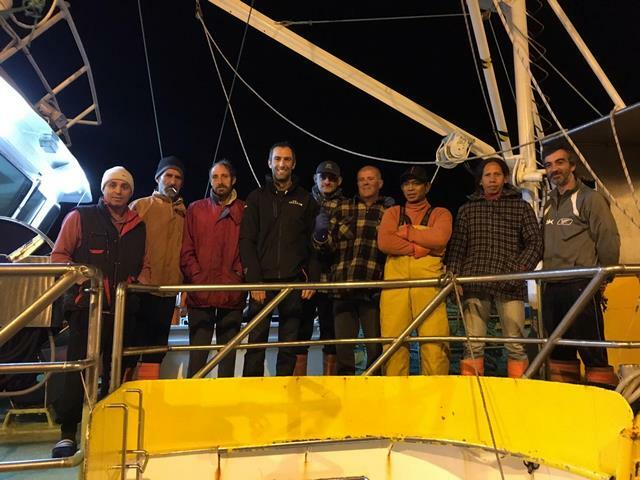 At that time, I was able to tell my team and the various means of rescue to say that I was on board and that the rescue operation had gone well and that we would then go to Vigo (Spain). but it would take a little bit of time because it took two and a half days to reach the destination port. The whole team is mobilized to try to recover the boat, today things are set up. It's not easy, because the boat is between the Azores and Cape Finisterre, the conditions of sea and wind are a little agitated at the moment, it is necessary to find the good boats, there is normally a boat which will leave in the coming hours with a part of the team Banque Populaire to go get the boat as soon as possible. "